Suppose you are looking for a unique gift for a friend, family member or a loved one. You can find just any puzzle, but no photo puzzle. There are several jigsaws offered online, mostly produced by the heat transfer method, where pieces are all the same shape and are transferred onto a thin unstable cardboard. With "Venus Puzzles" we are proud to introduce a high quality with a competitive price and prompt customer service. How are the "puzzles of excellence" made? 1. Once your photo is properly cropped and resized to the final picture puzzle dimension (we never stretch images), we print your photo onto professional photographic paper. The print is covered with a semi-gloss finish. 2. This print is mounted onto quality blue puzzle cardboard. The thickness of the cardboard is 0.079" (1.75 mm) which makes it very sturdy. Large puzzle factories use this cardboard for their products for its exceptional quality and strength. 3. The board is then die cut using professional laser-made cutting moulds. Different shapes of pieces fit together perfectly, as they are precisely cut. Each picture puzzle size comes with slightly rounded corners. 4. The pieces are broken apart, placed in a plastic bag with a zip lock and then packed in a high quality two-part cardboard box. The box is totally custom printed, with the picture on the lid and box sides (no stickers with a pre-made blank box). This sturdy box is shrink wrapped in transparent foil. Now, the product is exactly like a puzzle that is sold in the toyshop, or bookstore. Detailed photo puzzle description can be found in appropriate category on order page. 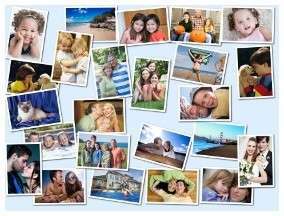 Select your preferred picture puzzle size, upload your photo and fill the order form. In case of further question, please visit our HELP/FAQ page. Questions about suitable photo quality, processing time, quality of picture puzzles, shipping ,payment and much more can be found here. Our cutting blades were designed to meet or exceed your expectations. The size of each piece is similar. However, each piece is of a unique shape. Special blades not only cut but also slightly bend the piece edges, which makes them easy to assemble. Our two-Beautiful packing, custom printed boxes for all orders part printed box, which is made of stable cardboard with mounted printing makes it fully customized to each order. The picture on the lid and sides of box - one of a kind pack. If we set out to picture puzzles, we always ensure that we do it impeccably. High quality printing, deep colors. We use printers with high-resolution printing and EFI Fiery print controllers. 1200 DPI or so you might say. The picture puzzle has bright colors and deep contrast. And for dessert, we make sure that the print has a satin-like sheen. Have you nearly assembled a jigsaw but you then discover that there is a missing piece? We do provide a missing piece reproduction for personalized puzzles. No problem at all. No matter if the piece was lost during production or on your end when assembling picture puzzle, we will reproduce it and deliver it to you free of charge. Don’t worry, you will not have to re-assemble it again!